In 12-inch nonstick skillet, cook sausage and beef over medium-high heat 5 to 7 minutes, stirring often, until thoroughly cooked; drain. Stir in beans, diced tomatoes, garlic powder, cumin, salt and pepper. Cook 2 minutes or until thoroughly heated. In 2-quart saucepan, stir together soups and enchilada sauce. Cook over medium heat 3 minutes, stirring constantly, until thoroughly heated. Spoon one-third of the sauce into baking dish; top with 3 of the tortillas. Spoon half of the meat mixture over tortillas; top with another one-third of the sauce and 1 cup of the Cheddar cheese. Top with 3 tortillas. 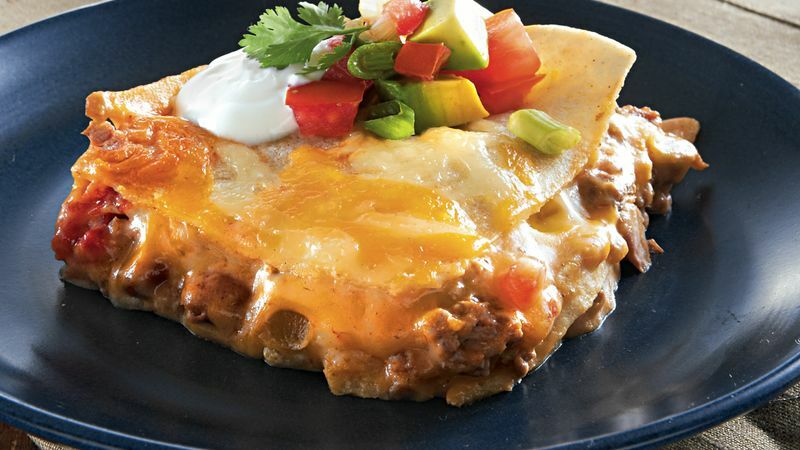 Repeat layers with remaining meat mixture, sauce, Cheddar cheese and tortillas. Sprinkle with 1 cup of the Monterey Jack cheese. Cover loosely with foil. Bake 20 minutes. Uncover; sprinkle with remaining 1 cup Monterey Jack cheese. Bake 10 minutes longer. Let stand 10 minutes before serving. Top with tomato, onions, avocado and dollop of sour cream. Garnish with cilantro.